"There is just something about this place that hooks you and makes it almost impossible not to stay. Living here, I can afford to enjoy a coffee and a long talk with a friend in the afternoon sunlight at one of Porto's many outdoor cafes. I can walk through old streets without a destination, knowing I will discover a new set of favorite little corners. Life in Porto is full of these kinds of moments." "If you want a quick breakfast, you can buy a tosta mista (ham-and-cheese melt) and a galao (latte) for less than $3.25. Or, if you want to enjoy a drink with a friend, a glass of Super Bock—the most popular beer—costs a little over a dollar. For about $5.50, I can walk away from a family-owned produce shop with a bag full of bananas, grapes, pears, apples, kiwis, plums, garlic, spinach, onions, carrots and cabbage. No matter how many times I buy fresh produce from this place, I am still pleasantly shocked every time I get the bill." Portugal's cost of housing is another bonus that's hard to resist: Jamie lives in a charming Portuguese house with three bedrooms, two bathrooms, a large foyer, living room, kitchen, dining room, studio and balcony. The rent, including expenses, comes to around $780 a month. And if you only need a single room, Jamie says it's common to be able to find a place for less than $350 a month. "For someone who was paying $1,500 per month for a room in a 2-bedroom apartment in Santa Monica, California, this dramatic decrease in living expenses has allowed me to spend less time working just to pay the rent…and more time actually living and experiencing life." But here's the thing…you may want to stay just where you are, since as soon as you step outside Portugal's borders, you'll be spending more money…because this under-the-radar retirement destination is definitely the lowest-cost spot in Western Europe. "As a digital nomad, I spend months at a time in different parts of Europe and all around the world, but when I made my first trip to Portugal, I was blown away. I'd been to Spain, and found Portugal cheaper—especially in day-to-day things like groceries, getting around, entertainment, meals out and places to stay. I'd heard that Spain was the most economical place to go in Western Europe, but Portugal beats it hands down, especially when compared to cities like Madrid. There may be parts of Spain that are cheaper than Portugal, but overall, it's no contest: Portugal was definitely more affordable for me—and the Wi-Fi was totally reliable everywhere I went, which is important for a writer. On the Continent, you'd have to travel across to Slovakia, Romania, Poland or other parts of Eastern Europe to find a cost of living that rivals Portugal." According to long-term Portugal resident and IL correspondent, Tricia Pimental, Portugal's cost of living—as of April 2018—was calculated at more than a third lower (and up to 50% cheaper to rent in certain areas) than the US. A meal for two in a mid-range restaurant in Portugal will set you back only €30 compared to €50 in France. Or, if you want to enjoy a local beer in Portugal, you'll pay only €1.50. …and if you're after a beach hideaway and are comparing Portugal's Algarve region in the south of the country with Spain's Costa del Sol, the news is just as good: based on a recent study of nearly 9,000 houses on a popular Spanish real estate website, average property prices along the Costa del Sol run at $421,600, while another real estate company lists average prices in the Algarve at $265,800—with over half of the available house listings coming in at under $216,000. Imagine enjoying a leisurely two-course dinner with a glass of wine and dessert for only $13 per person…at these kinds of prices, it's easy to see why Portugal should be one of the first countries on your retirement radar, especially if you're on a fixed income. A three-course dinner for two in France will run $61.79(€50), while the same in Portugal is $37.02 (€30). With beverages, the news gets even better: a half-liter draught of domestic beer will set you back $6.18 (€5) in France, while in Portugal you're looking at $1.85 (€1.50). And according to Numbeo, living in New York City will cost you a whopping 99.85% more than living in Lisbon. And here's the clincher—you don't even need to be based in a large Portuguese city to immerse yourself in enchanting old-world culture, fresh, wholesome food and stunning scenery…because it's absolutely EVERYWHERE. Tricia says, "After moving to Portugal, we found we could live on approximately one-third of what it cost us in a small town in north-central Utah. An expat with a source of income from a private enterprise, retirement account or savings will discover that the cost of living is remarkably low. In the palace town of Mafra, a half-hour drive from the capital of Lisbon, a one-bedroom apartment can be had for a few hundred dollars per month. Need more room, or prefer privacy? A three-level, four-bedroom, four-bath detached home with a churrascaria (a separate structure containing a built-in barbecue) and a garden with fruit trees costs approximately $1,100 per month. A house fitting this description would probably sell for less than $250,000. Expect to pay about $165 per month for water, gas, and electricity combined." "Fresh seafood is everywhere, and there are organic sections in many supermarkets if you can't make it to the local farmer's market. Wonderful wines abound. A bottle that elsewhere might run $25 in a store and $40 to $50 in a restaurant runs about $8 on a Portuguese store shelf, with a good table wine under $5. As—or more- important—as the affordability factor, though, is the overall quality of life offered by this gem of a nation. Its people are patient yet proud. They understand the meaning of family, tradition and hard work. They love music. They love language." What makes Portugal such a desirable destination for investors, travelers, digital nomads, expats and retirees? It's the fact that even though you're paying much less than you may be used to, you're not sacrificing your quality of life. You still have some of the most efficient infrastructure and modern living in Europe…coupled with a slower pace that lets you truly appreciate each day. Living in Portugal gives you an abundance of choices: you can base yourself in a sleepy fishing village, a thriving beach resort, a mountain retreat or in the heart of vibrant Lisbon—where the restaurants, museums and attractions rival anything else in Europe. Whatever private hideaway you choose, you're sure to make new friends quickly…because Portuguese people are some of the most relaxed, family-oriented, helpful and courteous folks you'll meet anywhere. Whether you're just exploring the possibilities or thinking seriously about moving to Portugal, you'll find no shortage of spectacular locations, lifestyles and options to choose from. Although you can expect to pay more in major cities in general, a couple can live quite comfortably on about $2,034 (€1,645) per month. In the wind-surfing hotspot of Esposende (pop. 56,000) on the 'Green Coast' of northern Portugal, you'll discover a laid-back lifestyle along the Rio Cavado with fine dining, a romantic lighthouse and uncrowded beaches, where a 2-bedroom apartment rents for $320-$540 a month…or you can buy a two-bedroom apartment with en-suite bathrooms, a basement, terrace with garden, two-car garage and fully equipped kitchen with security system, central heating and solar panels for just under $462,000. If you like to be away from the hustle and bustle of city life and slow your pace right down, Esposende is well worth a look. Or sample life in Vila Nova de Famalicão, a pleasant inland town of 133,000 people just a half-hour drive northeast of Porto…where you'll have access to two international airports, over a hundred cafes and restaurants and a weekly farmer's market. Slip into Tentacaões Gourmet shop for a chat with Elsa (she speaks excellent English) and grab a homemade pastry, a cup of strong, fresh coffee, a glass of wine or some chocolate fettuccine. For a 3-bedroom apartment in this part of the country, monthly rent is around $490-$590, with purchase prices around $172,000. Life is good…and good value…in this quiet town 15 miles from the beach. Life in this chic, historic city has everything you could ask for: a vibrant seaside ambience, friendly locals, mild weather and delicious food and wine at appealing prices. Portugal's second-largest city is popular with expats and known for its year-round livability and pleasing blend of cosmopolitan sophistication and old-word ambience. "In an upscale residential neighborhood just north of Boavista, an elegant, modern 3-bedroom, 2-bath apartment with lots of light, a huge living room with balcony, hardwood floors throughout and 1,722 feet of space is currently for sale for $198,000. Prefer to live in central Porto? If you're after a well-located one-bedroom/one bathroom apartment, one was recently on offer in the upscale Aliados region. With wooden floors and a small balcony, this apartment puts you right in the action in Porto. Its asking price: just $64,000. Central Porto is home to only about 250,000 people, giving it a small-city, manageable feel (the greater Porto area is home to 1.5 million). You can stroll from the outskirts of the old city down to the waterfront—the Cais da Ribeira—in as little as twenty minutes." There is currently a finely renovated home available there for $127,100 with three bedrooms, two balconies and handy access to river beaches and the Guarda center. Portugal's largest city, Lisbon, is one of Western Europe's jewels…where every neighborhood seems to offer stunning views and you can choose between the culture and history of Belem, the sizzling nightlife of Bica and Barrio Alto or the bedroom communities of Oerras or Loures—where daily life is less frenetic but you're still close to everything. In Lisbon you may have to pay a bit more…but you get more convenience, entertainment, infrastructure and nightlife for your money. A one-bedroom apartment in the center of Lisbon in good condition and it’s located in a quiet neighborhood, close to transport (metro, train, and bus). There’s nice sun exposure and a garden view. This was on offer for $1,230 a month. In the prime, desirable residential area of Campo de Ourique a 1-bedroom apartment with wood floors and fully equipped kitchen…rents for $1,054 a month. One of the best things about Lisbon is how easy it is to get around…whether you own a car or not. If you like, you can forget about driving, live like a local and hop on the trams instead! Affordable luxury on 'the Portuguese Riviera'…. "Our typical spring day in Cascais consisted of rich coffee and delicious homemade Portuguese tarts at Bijou de Cascais. For under $10, our family of five could enjoy coffee on the patio in the golden morning sun. After an afternoon beach walk, we might find ourselves dining al fresco at Cafe Galeria's raw foods bar. Our children would wrap themselves in the blankets provided, get comfy in the handmade furniture and sip fresh fruit smoothies as the stars became visible over the darkening Atlantic Ocean." Colleen says that finding an apartment here is much easier than on the French or Italian Riviera, and the friendly locals and chilled-out atmosphere create a warm, authentic feel. "A two-bedroom apartment a two minute walk from the beach can be rented for about $1,105 a month, with all the amenities like a private sunny garden , and a patio included. A comparable apartment in Nice, France would easily set you back $3,000 a month." Other real estate examples from this area include a 3-bedroom, semi-detached house with three floors and two balconies for sale at $485,100. If an average winter temperature of 77°F sounds like your style, then set yourself up in the Algarve. Once just a collection of sleepy fishing villages perched on low cliffs, this region is now a legendary destination for global sun-seekers, golfers and active expats… a place where every beach town is as attractive as the next and bright sunshine is the norm. "Although this is a small island, there's plenty to keep you busy. Thrill seekers will love the options for canyoning, paragliding, mountain biking and hiking. For something less strenuous, dolphin and whale watching off the coast has become popular in recent years. If the great outdoors isn't your scene, the latest movies are shown in Funchal, small local art and music festivals offer some culture and there are plenty of coffee shops for relaxing with a coffee and a slice of bolo de mel (a traditional honey cake). "Home to almost half the archipelago's population is the capital city of Funchal, which is where I rent a one-bedroom apartment—with Atlantic Ocean views—for $390 a month. Rents like this are not unusual in Madeira…you can easily find apartments, generally fully furnished, from $446." 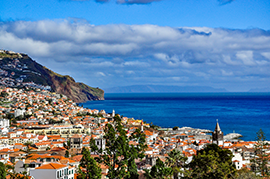 "Madeira has a temperate climate, which means warm and pleasant weather. Temperatures in summer can hit around 85°F, but it's comfortable heat. In winter the rain comes and the temperature drops to a manageable 55°F…but most days are crisp, clear and sunny." Along the numerous sand coves lining the Portimao coastline, you can spend your days beach-hopping and then your nights relaxing at Praia da Rocha's cliff-top promenade, where the restaurants and nightclubs buzz and the views are divine. Typical rentals in the area run about $477 a month for a studio apartment and twice that for a one-bedroom. A cozy property, five minutes from the beach with two beds and a bunk bed is for sale for just $106,600. Albufeira is the largest of the Algarve resort towns, but relaxing here is easy too. Rental property prices vary considerably, but recent offerings include two-bedrooms between $991 and $1,239. In Faro, you have access to an international airport but are still smack dab in the middle of some the loveliest beaches on the coast. Faro exudes a less touristy, more local vibe and is worth checking out for real estate bargains. A recent offering, on the popular Avenida 5 de Outobro, boasting a four-bedroom home in excellent condition was selling at $295,300. For a quieter, more low-key lifestyle, try the charming little town of Tavira, just 16 miles west of the Spanish border; it's the perfect base for exploring the eastern Algarve. Here, a two-bedroom, two-bath apartment in a gated community just listed for $353,189 to buy—this could be your own private oasis, away from the bustle of the central Algarve. So… What's The Best 'First step' Toward Living Your Dream Life In Sophisticated, Low-cost Portugal? If you've ever thought about making a major, positive change in your life and living in a sun-soaked place that lets you stretch your dollars…while enjoying sophisticated living in the midst of medieval history, natural splendor, a laid-back beach lifestyle and first-world infrastructure…well, that place is Portugal…and the time is now. As the mainstream media continues to spread the word about the benefits of retiring to Portugal, this country's charms and affordability won't stay under the radar for long. It's inevitable…the bargains you can still find in Portugal today WILL NOT last forever. But if you act now, you can still make Portugal your idyllic new home…at prices you never thought possible…provided you don't wait too long. What does a typical weekly shop at the grocery store cost in Portugal? What types of visas can I get if I choose to stay in the country long-term? As a temporary or permanent resident, how can I access Portugal's premier public and private health care systems? What are the cheapest ways to travel to and from—and around—Portugal? How do I qualify for residence status or arrange an investment visa? What kind of Internet speed and mobile phone coverage can I expect…in and outside of the major cities? Where can I find authentic, high-quality restaurants and modern supermarkets? What do I need to know about taxes if I decide to relocate to Portugal? How do I go about shipping all my belongings across the Atlantic…including my pet…and how much will it cost? What do I need to know to get the very best deal on long-term apartment leases in Portugal? How can I get local professional help to navigate the legal aspects of real estate transactions? Where do I find the best doctors, dentists, pharmacies and hospitals…and what can I expect to pay for routine and emergency medical treatment? To provide definitive, no-fluff, real-world answers to these questions…and hundreds more…we've created the most comprehensive guide to living, retiring, traveling and investing in Portugal ever…an all-new, completely up to date, meticulously researched Portugal resource that leaves no stone unturned in providing you with all the vital information necessary to make this Western European nation your new part-time or full-time home. This isn't a run-of-the-mill travel guide. It's a whole world away from Lonely Planet, Rough Guides or Fodor's. It's like nothing you've ever seen before…a jam-packed compendium of insider information, boots-on-the-ground details and must-have resources that you simply won't find anywhere else…a fully-loaded report that takes you by the hand and leads you through every single step you need to take to get your new life in Portugal off to a roaring start…even if you have no experience in living abroad. We've drawn upon the latest resources, compiled the most pertinent firsthand information, gathered the most indispensable contacts and picked the brains of seasoned expats and retirees living in Portugal RIGHT NOW to give you the kind of deep, how-to insights that leave ordinary travel guides in the dust. This Brand-New Hot-Off-the-Presses resource is called Escape to Portugal: Everything You Need to Know to Retire Better, Invest Well, and Enjoy the Good Life For Less. …and it gives you everything you need to start your own Portugal journey, whether your goals are travel, short or long-term living, retirement or investing in this welcoming country. You won't find a more current or comprehensive guide to today's Portugal anywhere…because it doesn't exist. We've done all the hard work for you, so you don't have to wonder about the steps you need to take to make your Old-World Europe dream a reality. When Tricia Pimental and her husband decided to move overseas in 2012, they looked at a number of options: Ecuador, Colombia, Spain, France…even Malta. They'd vacationed in Portugal and remembered how exciting and different their experiences were. And they quickly realized something…in the midst all this country's cultural richness, they found that for lodging and meals, they were only spending a slim percentage of what they'd experienced in other European countries…or back home in Utah. "That's when life changed from relishing a few weeks of vacation to living a casual lifestyle in a place more budget-friendly and accommodating than we'd ever imagined", Tricia says. When Tricia graduated from Brooklyn College of the City University in New York with a B.A. in French, she began to travel…to France, Canada, Mexico, Central and South America, Turkey, Israel, Russia, the Baltic states and most of Europe. She's the author of three award-winning books, including A Movable Marriage: A Memoir. And she is also the author of the Brand-New guide Escape to Portugal: Everything You Need to Know to Retire Better, Invest Well, and Enjoy the Good Life For Less…your personal resource for starting a new life in Portugal. It's like having your own professional Portugal consultant on hand to answer all the critical questions and provide the latest on-the-ground advice. Except you don't have to pay thousands in consultancy fees to access this once-in-a-lifetime compilation of essential Portugal information…not even close…it's available to you for so much less than that. None of them compare to our latest and greatest all-in-one resource to breathtaking Portugal. It Couldn't Be Easier—Or More Affordable—To Get Started! We've created this power-packed Portugal guide to help our readers save time, money and aggravation when planning their own Portugal adventure. 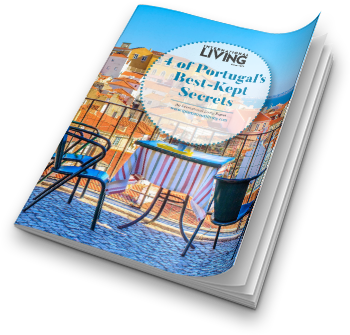 The hard-won advice and insider travel secrets you'll discover in its pages are every bit as unique and affordable as Portugal itself—and the tips, tricks and wealth of information it contains will give you a huge edge over anyone who is trying to 'wing it' in a move to Portugal. So how much does it cost to get your hands on this ultra-powerful Hot-Off-the-Presses Portugal resource? The amount of effort that has gone into putting together Escape to Portugal: Everything You Need to Know to Retire Better, Invest Well, and Enjoy the Good Life For Less might make you think we're going to ask you to pay hundreds of dollars for the crucial firsthand information and cutting-edge insights it contains. But we're not going to ask you to do that. …and we want there to be no barriers between you and an exciting new life in one of the most extraordinary, livable and low-cost countries on earth. That's right…for $99, you can have all the information at your fingertips to discover the affordable wonders of life in Portugal…with all the specific steps spelled out so you can start your new Portuguese adventure whenever you're ready. 4 of Portugal's Best-Kept Secrets. In it you'll learn more about this country's gorgeous hidden treasures, from Algarve beaches and budget-friendly cities to the tranquil country life of the Alentejo region. Discover festivals for every taste…check out our insider guide to hassle-free renting in Lisbon…and much more. If this extra report were to go on sale in International Living's Bookstore, we would charge $29.95 for it. But we're offering it as a special bonus for readers who order Escape to Portugal: Everything You Need to Know to Retire Better, Invest Well, and Enjoy the Good Life For Less… Yes, you read that right—you'll receive our Just-Released, all-inclusive, one-of-a-kind Escape to Portugal PLUS our FREE bonus report 4 of Portugal's Best-Kept Secrets… all for the unbelievably low price of $99. Once you read about everything Portugal has to offer…and read the stories about the people who are living the good life there, I expect I'll meet you in Portugal someday very soon. I look forward to it! So what are you waiting for? Portugal's low-cost, Old-World charms are waiting for you! You won't find information like this anywhere else…at any price. It could be one of the smartest decisions you make this year…or in your entire life. Please note that this is in a downloadable PDF format. 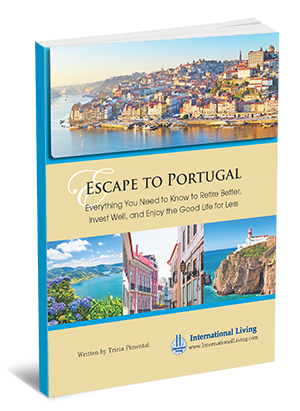 If you'd rather purchase the print version of Escape to Portugal: Everything You Need to Know to Retire Better, Invest Well, and Enjoy the Good Life for Less, please click here. P.S. The comprehensive and all-inclusive Escape to Portugal: Everything You Need to Know to Retire Better, Invest Well, and Enjoy the Good Life For Less… is not available anywhere else…at any price. If you're interested in investing or living the laid-back, low-cost European lifestyle (full or part-time) but not interested in paying typical European prices, Portugal should definitely be front-and-center on your radar. Order now and we'll also send you a special bonus, FREE when you order the BRAND-NEW, Just Released Escape to Portugal: Everything You Need to Know to Retire Better, Invest Well, and Enjoy the Good Life For Less today.